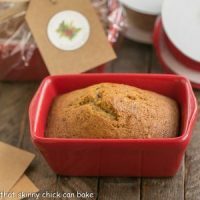 A classic pumpkin bread recipe that’s always a hit. Make mini loaves for hostess or holiday gifts! Preheat oven to 350º. Grease pans. First whisk in the eggs, then the pumpkin. In another bowl, whisk together the flour, baking powder, salt, baking soda and spices, then add them to the pumpkin mixture and mix just until combined. Do not over-mix. Stir in the water, then divide the batter between pans. Bake 35-40 minutes for small loaves. If you’re using a full size loaf pan, start checking at about 60 minutes, but my heavy duty loaf pans usually take more like 75 minutes. Check the center of the loaf with a toothpick. It should come out clean after inserting when the loaf is done. My mini ceramic pans measure 5 x 3 x 2 inches. You can find them at Michaels.